Good natural horse hoof care is not just about barefoot trimming. It concerns every aspect of the horse's lifestyle: feeding, management, and health-care - even down to the way he moves. Happily, general awareness of the importance of barefoot or natural horse hoof care is now growing significantly in the horse community. However the practice of shoeing still remains a deeply entrenched tradition, despite the fact that it is one of the most damaging things that we humans do to horses. 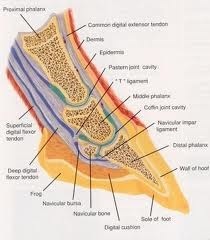 Within the tough outer exterior of the hoof capsule is a complex layering of tissues in which the skeletal structure is suspended.The horse's hoof has the task of providing the structure to support and cushion the great weight of the horse, while being able to constantly replace the wear caused by the vast distances covered by the horse in its natural state. The hoof has evolved to be perfectly adapted for these requirements, and natural horse hoof care seeks to allow the hoof to function in this way, despite the constraints of the domesticated horse's lifestyle. The practice of nailed-on iron horse shoes dates from the middle ages, and it is a tradition that has continued to this day, thought of by many to be a basic necessity for the working horse. 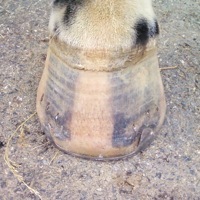 Unfortunately it is only relatively recently that the damaging effects of shoeing have become recognized, and still the vast majority of horse-owners are either ignorant of these effects or choose to turn a blind eye, the practicality and convention of shoeing outweighing the possibility of damage to the horse's health. The problem is that shoeing has been the norm for so long throughout history, that it has actually distorted the conventional understanding of what a healthy hoof should look and feel like. 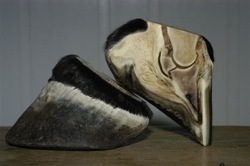 The beautiful form of the barefoot hoof (right), compared to the overgrown and deformed shod hoof. For example, one of the most damaging effects of shoes is the way that they significantly limit the natural expansion and contraction of the whole hoof capsule. In a healthy hoof this pumping effect contributes greatly to the circulation of blood throughout the whole limb and the foot itself. Considering that the horses limbs have evolved to be extremely long, the circulation of blood all the way to the feet needs all the help it can get! This prohibited blood circulation is why shod horses feet and legs feel cold to the touch (showing that the loss of circulation extends right up the leg), and this has become accepted as normal and 'healthy'. Barefoot horses' feet and legs feel warm - this is what is actually healthy. 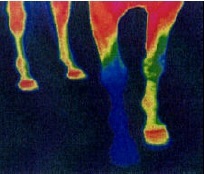 This picture, taken by Dr Hiltrud Strasser, DVM, Ph.D., is a thermograph which indicates the level of blood circulation with colour. 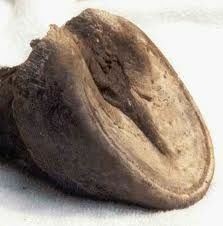 The horse had one shod foot - it is clear to see the huge impact this had on the circulation throughout the whole limb. The circulation issue is why many people who, aware of the benefits of natural horse hoof care, soon give up after changing their horse from shoeing to barefoot. When a previously shod horse has the shoes taken off, his feet are essentially numb from lack of circulation. Somewhere between a few days and a few weeks later, the blood supply begins to come back, and if you've ever had numb fingers or toes due to the cold, you'll know that when the circulation returns it can be very painful. This is also the case for the horse, and at this point in the transition from shod to barefoot horses often become very sensitive in their feet, unable to tolerate hard or stony ground, and uncomfortable with the extra weight of the rider. Unfortunately it is then that many owners decide that natural horse hoof care isn't going to work for their horse, and they put the shoes back on. In fact all it takes is time and patience to allow the pain to die down once the circulation is re-established. See Going Barefoot: Seven Steps for Success. 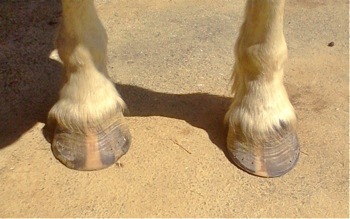 The poor circulation of shod horses also significantly decreases the quality of the horn of the feet. It often makes it very brittle and lacking in resilience. Considering that it takes around a year for a whole hoof to grow down from the coronet, once the shoes have been taken off, this is how long we have to wait before healthier horn is contacting the ground. So it is common for ex-shod horses' feet to chip and break very easily during this period. Unfortunately when the hoof wall breaks, it usually does so higher up than the level of the sole, resulting in greater sensitivity in the feet. Another reason why people often go back to shoeing. This is also why it doesn't matter what sophisticated nutritional supplements you give a horse, it still takes a healthy blood supply to nourish the cells that are growing the horn. The same goes for any product applied to the outside of the hoof wall: once the horn has grown down from the coronet, the cells are already dead, and it is too late to attempt to rehydrate them from the outside. Healthy horn comes from the inside out. 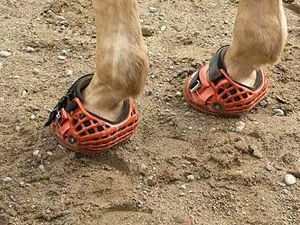 People often refer negatively to barefoot horses' feet 'spreading' once shoes are removed. In fact shod horses' feet are unnaturally fixed into a contracted state because the shoe is nailed on when the foot is raised off the ground. 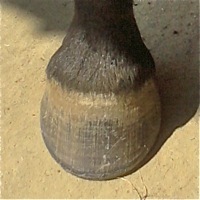 The hoof is supposed to be able to expand when it is on the ground taking the weight of the horse, but the rigid shoe prevents this to a large extent (the worst case being egg-bar shoes which allow for zero expansion). When a previously shod horse's feet regain a less narrow and boxy shape this is a good thing! And in fact healthy barefoot hooves are overall much more compact than shod ones once they begin to regain the right shape. The left picture shows a shoe-damaged foot with its narrow 'squashed' shape. The yellow lines indicate the angle of the bars which here is extremely narrow compared to the wild mustang's hoof on the right. 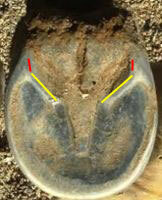 The heels (indicated by the red lines) are actually angled-in from the contraction imposed by the rigid metal shoes. In fact this mare has been barefoot for the last ten years - her feet have improved a lot, but the profound damage from shoeing in the early years of her life is still evident. Note also the unhealthy shrunken frog compared to that of the wild hoof, this is an outward sign of weakness of the internal structures, such as the digital cushion, which were never able to develop in the crucial formative years until the age of five, partly due to the hoof being fixed into contraction, and partly from the lack of stimulus when the frog is permanently raised off the ground by the shoe. One crucial step in good natural horse hoof care is regular hoof trimming that is adapted for barefoot hooves as opposed to the farrier's trim which is geared for shoeing. The natural trim emulates as closely as possible the way a wild horse's feet would wear themselves through movement to maintain healthy form and function. This mare has just had her shoes removed. The foot on the right has had a natural trim, and already shows a significant improvement from the distorted shape they were before, shown by the other foot which hasn't yet been trimmed. Most natural horse hoof care practitioners are now agreed that hoof boots are absolutely indispensable for a smooth transition between shod and barefoot. Furthermore, experts who have studied and compared the movement of shod, barefoot and booted horses conclude that the use of hoof boots on a permanent basis is necessary to ensure the comfort of domestic horses' hooves. Hoof boots are just like shoes designed for horses, used only (except in special cases) when the horse is ridden or worked. They provide the protection and comfort the horse needs to overcome the increased sensitivity after shoeing, and protect the poor quality hoof wall from excessive wear and damage. See: Hoof Boots: A Revolution In Horse Hoof Protection for more on hoof boots. Addressing your horse's diet is an essential part of natural hoof care, because the domestic horse's commonly high-sugar diet is directly damaging to the feet. See Horse diet: its role in hoof care. Most importantly it takes patience and commitment to go barefoot, because it's really about taking the responsibility for your own horse's feet, as opposed to handing it over to the farrier. Even if you have a barefoot expert to trim your horse's feet regularly, natural horse hoof care still demands that you be aware of your horse's feet in a much more sophisticated way than shoeing does. Did you know that the horse's movement is greatly influenced by the state of his feet? It's not surprising when you think about it, considering the mechanical role of the foot in the suspensory functioning of the limb, but even more importantly, the horse's foot is full of nerves whose interaction with the way the horse contacts the ground is an integral part of the way the horse moves. This is why it is important for anyone who is interested in optimizing their horse's performance to take natural horse hoof care seriously. In fact there is a vital symbiosis whereby healthy hoof function and good movement serve each other. This is because the way a horse lands on its feet in movement not only depends on the health of the foot, it also plays an essential part in creating this health through providing the right nervous stimuli. Natural horse hoof care sets out to facilitate and optimize this healthy stimulation. The other side of the coin is that unhealthy feet and inhibited movement also go hand in hand. This is why, for anyone who is interested in not only the all-round health of their horse, but also the quality of his performance, understanding what good natural horse hoof care really is (as opposed to accepting the ignorance of convention) is indispensable. When we look at the beauty of form and function of wild horses' feet (those living in the right environment to make this possible) - their resilience and efficiency - it is easy to get idealistic about what is possible for our domesticated horses feet through natural horse hoof care. But we have to realize that the factors that go towards making wild horses' feet the way they are just aren't possible to the same degree for the domestic horse. 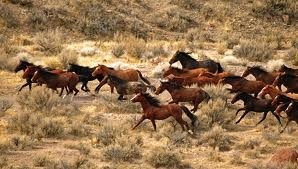 The two main differences are firstly that wild horses are on the move from the moment they are born, often covering considerable distances every day, whereas domestic horses are far too often constrained to standing still in a stable, or the moderate improvement of a usually un-stimulating paddock. 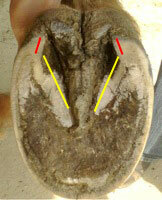 Strong healthy hoof structure and movement are interdependent. Secondly the diet that the horse is naturally adapted to, and which is conducive to healthy feet, is far removed from that of the domesticated horse. Whether it be through grain, molassed feed, or rich/overgrazed grass, the domestic horse has a much higher dietary sugar content than the wild horse, and this has a big impact on the feet, namely through the widespread problem of laminitis. For more on the diet and its importance in natural horse hoof care, go to Horse diet: its role in hoof care. Both these significant factors mean that domestic horse's feet are more sensitive and prone to problems than the wild horse ideal, and, on top of that, we ride them - obliging them to carry our extra weight often on hard surfaces. Shoeing is a draconian but effective method of covering up these problems, because shoes not only separate the hoof from the ground, but they 'numb' it as well, as explained above, by inhibiting the circulation. Of course this is not a solution, as the hoof problems that frequently result, such as navicular disease, and arthritic joints, bear witness. These cross-sections, thanks to Barbara Page, D.V.M., show the massive difference in the development of the internal structures between the domestic horse hoof (left) and the wild horse hoof (right). The tissue marked DC is the digital cushion, very important for the healthy functioning of the hoof, this is often particularly underdeveloped in the domestic horse for the reasons described above. Firstly we must do our best to address the natural requirements of our domestic horses, encouraging as much movement as possible by limiting the time in the stable and using ideas like Paddock Paradise instead of uninteresting paddocks; and limiting as much as possible the sugar levels in their diet, providing as much of the forage that is natural to horses as possible. Then we must accept that the domestic horse still lacks the incredible thickness of structures such as the digital cushion under the frog that the wild horses possess, and give them the comfort and protection they need by using hoof boots. Hoof boots are the ideal solution for replacing shoes, and they are becoming more and more widely used, as horse owners who are already aware of natural horse hoof care start to understand their benefits. Interestingly, in perhaps the most demanding equine discipline: endurance racing, the top riders in the US are now using Renegade hoof boots. They not only protect the horses hooves over incredibly demanding terrain, but the fact that the horses are barefoot significantly improves their performance largely due to the increased circulation provided by the feet pumping blood as they should. Hoof boots provide the comfort that encourages the horse to use his feet in the way that builds up their strength, which in turn provides more comfort: a positive circle that is in the interest of all horses. The combination of using boots and learning the natural trim allows any horse owner to take responsibility for their horse's hoof care, and make a considerable improvement to his health and well being. This is the power of natural horse hoof care, and the reasoning behind the barefoot revolution which is slowly but surely taking hold in horse hoof care worldwide. The trimming technique that best emulates the beautiful and functional wild horse foot is actually simple and minimalist compared to many mind-boggling barefoot trimming techniques that require a thick manual to comprehend. 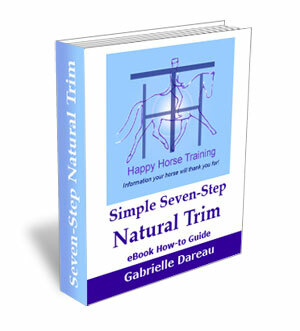 (See The Natural Trim: The Solution For Healthy Horse Hoof Care). Having experienced using an aggressive trimming technique that imposed purely mechanical instead of organic principles on the hoof, we realized eventually that the result was not what we wanted for our horses. Happily, thanks to Tara Calvert-Jackson, we discovered a completely different approach to natural horse hoof care, which respects the integrity of the hoof, and allows it to heal from the inside-out. Our eBook how-to guide The Simple Seven-Step Natural Trim gives you clear step-by-step instructions on how maintain your horse's feet in this way - the way nature intended. Barefoot horse hoof care is unfortunately still a minority practice, struggling against the deeply entrenched tradition of shoeing. We need to give barefoot all the help it can get to grow, and sharing personal experiences is an important way to do this. To share your own Barefoot horse story, and read other people's, go to: The Barefoot Horse Revolution: Share Your Story!